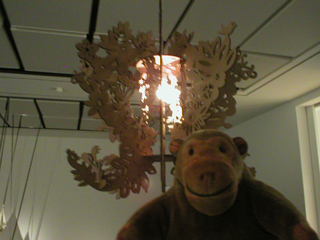 "It looks more like a lampshade than a chandelier to me, you know"
Mr Monkey admired Lisa Cheung's Chinese Princess chandelier. 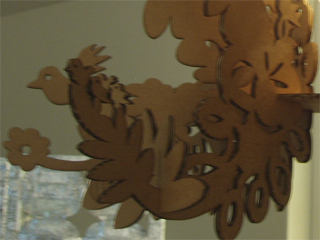 Made of laser-cut cardboard, it's part of a series based on the elaborate headdresses of Chinese Imperial princesses, and would be very useful if the the candles on the table didn't provide enough light. 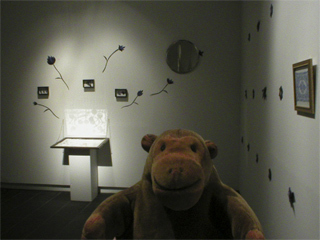 Then Mr Monkey went over into a corner to examine Pamela So's retro mixed media installation Boudoir.